HEAVEN SHALL BURN – ARTIST OF THE WEEK CONTEST / INTERVIEW! The legendary German Melodeath force Heaven Shall Burn have been named our Artist of the Week! We’re currently holding a contest with both the metal moguls themselves and Century Media. 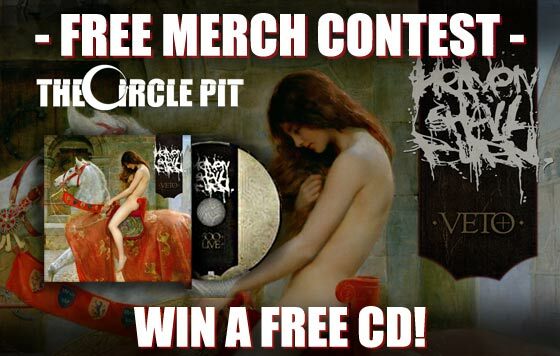 Enter for your chance to win a free copy of their latest album “Veto”! Also be sure to check out the interview we had with the insanely talented drummer Matthias Voigt for an in-depth look at the band. This contest ends Monday 5/27 at 9 PM EST! endorsed, administered by, or associated with Facebook. MT – Coming out of Germany, you guys have a huge international following. How does it feel to have so many loyal fans behind you? MV – It feels great, of course. I guess we could play anywhere and some people would show up. Not always a lot of people, but there are always some folks who know about us. We’re also a band that isn’t constantly touring or trying to gain a bigger following with touring 9 months a year. So it’s great to see that people follow us, although we’re not playing their places all the time. Obviously we have our biggest following in Germany, but we receive lots of messages from all over the world. The best part of being in a band is getting to know new places and people. Having an international following is really helping us a lot with that. MT – How did you come up with the name Heaven Shall Burn? And do people ever call you satanists because of it? MV – When we were sitting and talking about a new band name, there was this Marduk CD on the table. It was called “Heaven Shall Burn…When We Are Gathered”. We liked the term and we wanted to use the word “Heaven” as a metaphor for some kind of illusion that people have in their minds, some fake paradise. You know, something that keeps them away from seeing the truth and the reality that surrounds them. We want people to see what is happening for real and not living in their own, closed world. We’re not an anti-christian or satanic band, but when we talk about people who are following some illusion blindly, it can also be about people who are attracted to the dogma of organized religion. We see it in a more universal way. Following a religion or a God blindly, is only one thing. Some people might think that we’re satanic, but they shouldn’t judge the book by it’s cover. If they read the lyrics, they would know that we’re not talking about that. MT – You guys recently put out your album “VETO”. Can you tell us a bit about that record and what went into it? MV – We think that we’ve made some progression. We don’t know if people will notice all the details that we tried to focus on, but we can notice the difference. I really think that the sound is much better. It’s not only about loudness now, and we really added some dynamics that we didn’t have before. Take a record like “Invictus”: It’s a real challenge to listen to the whole record at once. I would even say it’s impossible. It’s always loud, always on the same level of intensity. It’s nice to have a hard hitting sound, but the listener needs some breaks sometimes. We finally realized that. Actually Tue Madsen, who mixed the record and also the previous ones, told us before, but we didn’t believe…haha. MT – Any songs in particular we should watch out for? MV – I think people should listen to the whole thing. It’s not a concept album, but it works best with all the songs played. But I’m like that in general. I’m not really song-oriented. I need to listen to the whole album because some records can create a special atmosphere, and this can only happen if you listen to the whole thing. MT – Your band plays some right heavy tunes. What inspires your music? MV – It’s everything, everything that is surrounding us, but also all the music we are listening to. There is anger in the music, frustration and aggression, but at the same time we still create something positive. Playing music is also a way of dealing with things. It’s a channel that can unite even negative aspects to something productive, positive. MT – Heaven Shall Burn has played some big shows this year including a massive headline at Impericon Fest III over some huge names. You also have several festivals lined up. You looking forward to playing them? MV – I’m taking a break from playing shows, due to some problems with my back, but the guys are really looking forward to the shows– but even more to finally play some new stuff. It’s always a good feeling to play new songs and see how people react to them. Plus, festivals are always cool because you meet lots of people and see other bands play. It’s always a challenge to play such events. MT – What’s the craziest thing that’s happened to you on tour? MV – This question is almost impossible to answer because it’s never funny or entertaining to tell such stories, unless you’ve been there as well. Things happen. Sometimes your baggage is lost at the airport and you need to wear the same clothes for some days and borrow instruments. It happened to us at our first tour in Brazil. Just imagine a couple of gringos, totally sunburned, all with the same cheap socks, shorts and shirts that we bought at some discount store in Sao Paulo. It’s nothing really crazy, but I felt like a pupil of a special school at some school trip. MT – Do you guys have any show rituals? MT – What are your plans for the rest of 2013? MV – There will be these festivals during spring and summer, but there are not that many shows confirmed right now. There might be a European Tour, most likely in November, but there is nothing really confirmed. MT – And that’s all we have. Thanks for your time! Any shout outs you want to give before we finish here? MV – Thank you a lot for the interview and asking what’s up with HSB! We really appreciate that. Hopefully some of you guys will check out the new record ‘VETO’. It’s going to be released in April. We also want to tour the USA, but I guess it won’t happen before 2014. But keep your eyes open!